Congrats on getting into college! Now, how much is it going to cost? It can be maddeningly difficult to figure out, especially for high school seniors who have just a few weeks left to compare offers and decide where to enroll. Instead of a straightforward bill, colleges send out what's known as financial aid award letters. The format varies by school, but the actual amount you have to pay often gets lost in the details about the various fees, scholarships and loans. One of the most common trip-ups is not realizing a loan (money you have to borrow and pay back, with interest) is factored into your estimated cost. It's easy to be fooled. Award letters don't often make a distinction between loans and scholarships (money you don't have to pay back). A college-bound senior received the letter below. 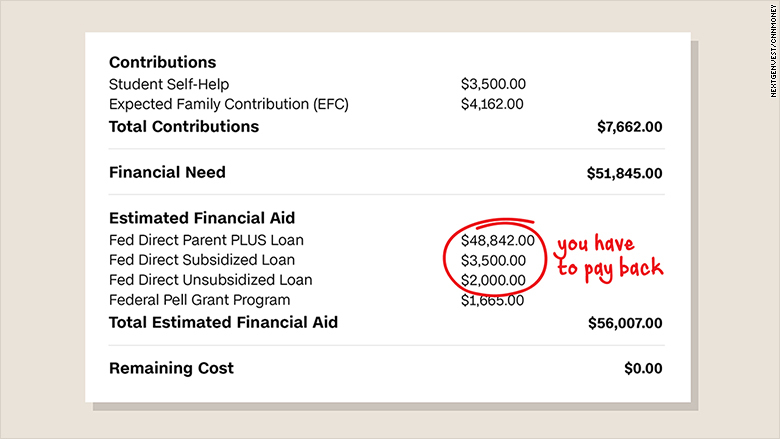 It lumps together loans with a grant to get a "Total Estimated Financial Aid" figure, without pointing out that you'd have to pay back a majority of that aid (we did that for you). "To expect an 18-year-old to fully understand some of these aid letters is ludicrous. They can be misleading and, as a result, some students don't realize the debt burdens they're signing up for," said Kelly Peeler, whose company NextGenVest advises high school students on getting into college and paying for it. NextGenVest communicates with students and parents mostly over text, and sometimes Snapchat. One of the most common questions the hotline receives is: "How do I read this letter and understand what I actually need to pay?" 1. Tuition and fees + room and board = ? Hopefully it will be easy to find the part of the letter that explains how much the total cost is -- before taking any discounts like scholarships into consideration. Make sure it lists ALL costs including, tuition, room and board, any fees, and a meal plan. If it's unclear, call the financial aid office to ask. There will also be costs for books and other living expenses, but those you'll have to estimate. 2. Look for the words "scholarship" and "grant." Your financial aid letter may be the first indication that you've been awarded a scholarship or grant from the college. These could be based on your financial need or merit-based, and determined by things like your high school GPA, SAT and ACT scores, or interest in a particular subject. You may also receive a Pell Grant from the federal government, which is based on your family's income. Either way, you do NOT have to pay back scholarships or grants. Subtract this amount from the total cost you figured out in Step 1. 3. Do you need to borrow money? Maybe you've won additional scholarships that aren't listed on the financial aid letter. Subtract those from the amount you calculated in Step 2. If there's a remaining cost, this is what you or your parents may have to chip in -- or you might have to take out a loan. The amount your family can pay is actually calculated by the college, based on information like their income which you submitted on the FAFSA form. This might be noted on your financial aid letter and called something like your "Estimated Financial Contribution" and is used to help determine how much need-based financial aid you received. But it's not exactly what your family must pay. 4. What's the difference between subsidized, unsubsidized and Parent PLUS loans? A subsidized loan does not accrue interest while you're still in school, but an unsubsidized loan does. Parent PLUS loans are also from the federal government, but they carry a higher interest rate and it's your parent who's ultimately responsible for paying it back. Interest starts accruing right away, like an unsubsidized loan. Hopefully, the amount you're allowed to borrow from federal loans is enough to cover the cost. But sometimes it isn't. If so, you might have to take out a private loan from a bank. Those usually require a cosigner who has good credit, and come with higher interest rates than the federal loan so you want to use those as your last resort. But you don't actually have to borrow the full amount allocated in your financial aid package. The amount listed for each loan is a maximum. In any case, you'll still end up owing more than the loan amount you see listed after you graduate because of interest. Keep in mind that this is just an estimate for one year of college and you'll likely be going for four years. 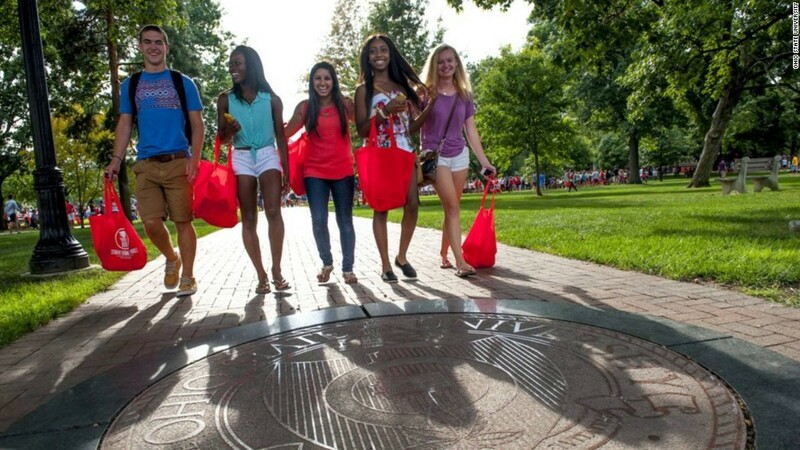 Looking at the bigger, four-year cost may help you decide whether it's worth enrolling at a more expensive college. And be sure to see if there's a note about whether your scholarships and grants are guaranteed for all four years -- or just call up the college's financial aid office and ask. Did you get into your dream college and can't figure out how you can afford to go? Share your story with CNNMoney by emailing Katie.Lobosco@cnn.com and you could be featured in an upcoming story.